HISTORY OF THE BLAA – The tradition of baking of The Waterford Blaa dates back to the arrival of the Huguenots. whatever countries gave them shelter, including England and Ireland. a port of trade capable of developing their mercantile abilities. this is when the Huguenots introduced The Waterford Blaa. Unlike other bakery products in this category The Waterford Blaa ontains no enrichment and is made from preservative free strong bakers’ flour, table salt, compressed yeast, dough conditioner and water only. which is a characteristic of the product. As Waterford Blaas are not baked with steam the heavy dusting of flour is both for protection from oven heat and to enhance the appearance. 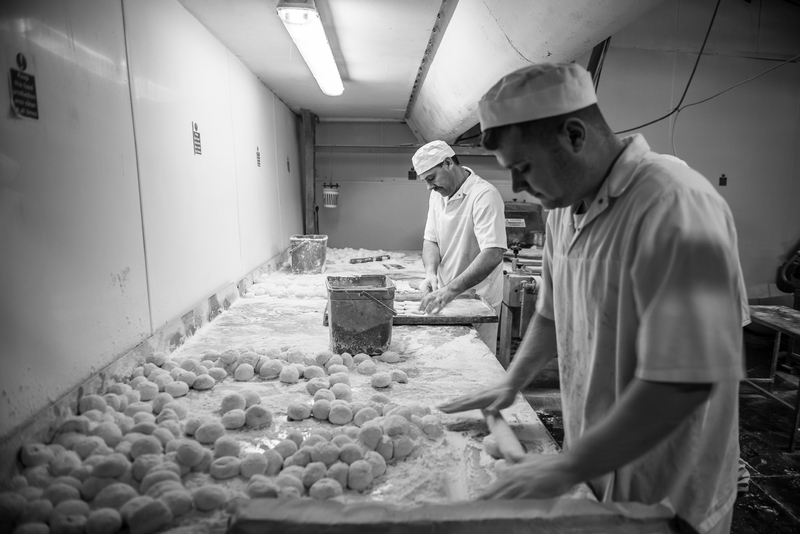 Throughout the production process of the Waterford Blaa there is excessive use of flour, at pining, resting etc. there is also flour on the base of the Blaa. Waterford Blaas are characteristically not uniform in shape and size. Waterford Blaa is a popular breakfast product usually baked during the night and sold as a bread product normally eaten with just butter or as a mid-day snack to make sandwiches with a variety of everyday fillings including crisps, rashers, red lead, ham, black pudding or steak and relish. Waterford Blaa is best when torn apart by hand and eaten fresh with real butter, straight from the bakery. The Waterford Blaa Bakers Association was set up in 2009 as a registered partnership when four well known and long established family bakeries from County Waterford and South Kilkenny came together to form the group. The association operates as an official body under the Irish Baker’s and Confectioners Association. The primary objective of the group is to protect the traditional Waterford Blaa as a unique regional Irish food product. The Bakers also co-operate to improve quality and Marketing of Blaa’s in the region and participate in food festivals and food award events.